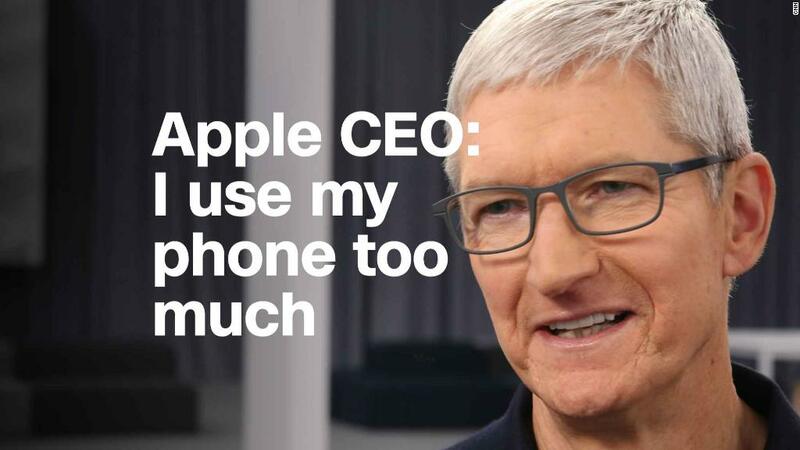 Even the CEO of Apple is surprised by how much time he spends on his devices. Tim Cook told CNN's Laurie Segall, in an exclusive TV interview, that he had a wake-up call about his own tech habits after seeing data from a newly unveiled Apple (AAPL) tool that will provide detailed reports of how much time users spend on the iPhone and iPad. "I've been using it and I have to tell you: I thought I was fairly disciplined about this. And I was wrong," Cook told Segall after Apple's annual developer conference Monday. The feature, called Screen Time, shows users their daily and weekly time spent in each app and also lets them set time limits for specific apps. Users will also be able to see how many notifications they received and how often they picked up the device. "When I began to get the data, I found I was spending a lot more time than I should," Cook told Segall, while declining to list which apps occupy the most of his time. "And the number of times I picked up the phone were too many." Screen Time was the centerpiece of what proved to be a key focus for Apple at the event Monday: Helping users build healthier relationships with their devices by limiting the constant digital distractions and better managing their time. Apple also expanded its Do Not Disturb feature to hide all notifications on the main screen at night when you're trying to sleep. Users can also set the Do Not Disturb option to automatically end when they leave a location or an event wraps up. Welcome to 2018, when tech companies hold major press events to introduce innovative ways to use their products less. The moves come amid broader scrutiny of the impact that tech is having on society, not just with fake news and election meddling, but also on users' personal well-being. Apple investors pressured the company in January to do more to prevent excessive smartphone use among children and teenagers in particular. Current and former Apple executives have also raised concerns about overusing the iPhone. "The device is not addictive in and of itself. It's what you do on it," Cook told CNN. "Whether the word is 'addiction' or not, I don't know." "Each person has to make the decision when they get their numbers as to what they would like to do," Cook added. Apple isn't alone in this effort. Last month, Google (GOOGL) introduced a similar feature to show users how they spend their time on their phones. Earlier this year, Facebook (FB) CEO Mark Zuckerberg said the company took steps to show fewer viral videos in News Feed "to make sure people's time is well spent." For Apple, however, there's less concern in encouraging users to take breaks. Facebook and Google make the vast majority of their money by selling ads. The more time a user spends on their services, the more ads he or she might see. Apple, on the other hand, makes most of its money by selling devices, not ads. "We've never been focused on usage as a key parameter. We want people to be incredibly satisfied and empowered by the devices that we ship," Cook told CNN. But, he claimed, Apple "never wanted people to spend a lot of time" on these devices. The fact that Apple's business is not primarily dependent on advertising has also made it easier for Cook and the company to take a strong stance on privacy at a time when consumers and regulators are scrutinizing Facebook for the data it collects and shares. At the developer conference Monday, Apple unveiled a new option in its Safari browser to stop social media sites from tracking users without their permission. The company used Facebook as the example in its presentation. In the CNN interview, Cook stopped short of calling out Facebook directly. "We're not focused on any singular company," he said. "The privacy thing has gotten totally out of control," Cook said. "I think most people are not aware of who is tracking them, how much they're being tracked and sort of the large amounts of detailed data that are out there about them." 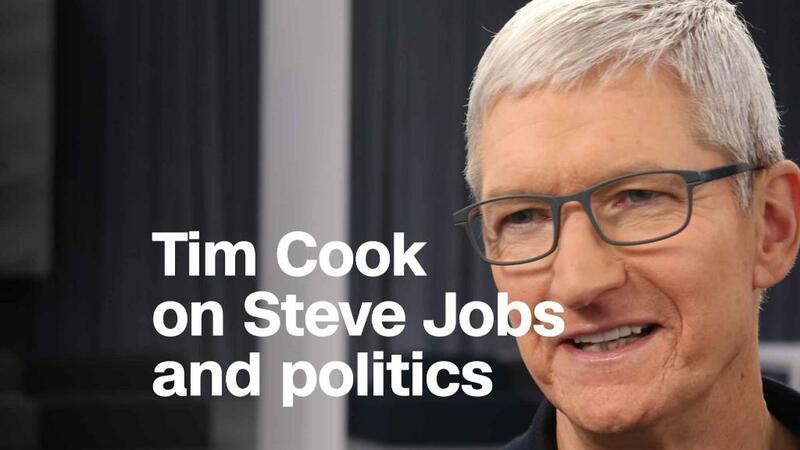 At Apple, Cook told CNN, "We think privacy is a fundamental human right."